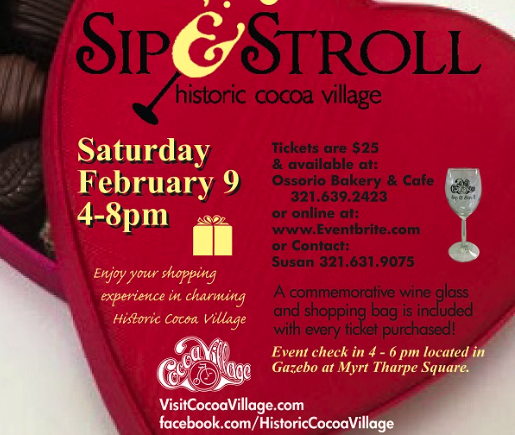 Grab your sweetheart and come on down to Historic Cocoa Village for the Champagne & Chocolate Sweethearts Sip & Stroll. In addition to our normal offering of wine sampling and snacks, our merchants may have either champagne or sparkling wine and something chocolate. Event times are changed to 4 PM ‘till 8 PM. Please note the changed times. Check-in will begin at 4 PM in the Gazebo. For the ticket price of $25 you will receive a Sip & Stroll commemorative wine glass, and a map of the participating merchants. Don’t forget – your ticket purchase automatically enters you into the drawing for one of our fabulous gift baskets. For each of the outlying businesses visited, (marked in red on the map), a chance to win the special ‘Outlying Business’ basket is earned. That’s one additional chance to win for EACH ‘Outlying Business’ visited. Then the fun begins! Stroll through the streets of Cocoa Village sampling wines, enjoying treats and taking advantage of merchants’ special deals. For more information, call Susan at 321-631-9075. Tickets are available at Ossorio Bakery & Café or online at www.eventbrite.com.